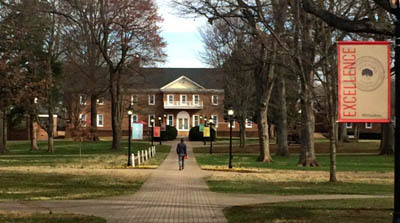 Guilford College, a leading liberal arts college in Greensboro, North Carolina, sits on the land once owned by legendary abolitionist and Underground Railroad leader, Levi Coffin. Often called the “President of the Underground Railroad,” Coffin and his wife, Catharine, devoted members of the Society of Friends (Quakers), helped over 3,000 slaves to find freedom, initially from North Carolina — until slave owners’ persecution of abolitionists became too grave — and, later, in Indiana and Ohio. Affiliated with the Society of Friends, Guilford College is located on Coffin’s former New Garden Farm property, which he was forced to flee. Today, Guilford carries on a mission that includes social justice, peace, and a commitment to sustainability. The college has supported a farm since its inception and has now created a sustainable farm that produces over 10,000 pounds of food a year and features a farmhouse built by students from fallen trees at Guilford. RCC President, Bob Musil, was invited to lecture and hosted at Guilford by Holly Peterson, Chair of the Department of Environmental and Sustainability Studies. Musil lectured on “Rachel Carson’s Legacy for North Carolina Today,” and focused on the climate and justice effects in North Carolina of Concentrated Animal Feeding Operations (CAFOS), including those for hogs and chickens. Guilford County, where the college is located, is part of a large swath of industrial poultry production in central North Carolina, with a huge Tyson’s CAFO located southeast of Guilford College. Although Rachel Carson was not a Quaker, Musil explained, her ethic was quite similar to the Society of Friends and to the “reverence for life” of Dr. Albert Schweitzer, the 1952 Nobel Peace Prize winner. Carson saw all creatures and all people as part of creation and worthy of respect. She saw the great issues of her time — nuclear disarmament, the dangers of toxic chemicals, and even early warnings of global climate change, as linked. Thus it is no surprise, Musil said, that Carson was an early opponent of CAFOs which she denounced in the 1964 Foreword to Ruth Harrison’s pioneering exposé, Animal Machines. 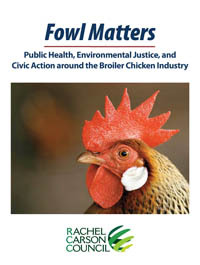 According to Musil, the RCC carries this Carson legacy and ethic forward with its current opposition to CAFOs and with major reports like Fowl Matters: Public Health, Environmental Justice, and Civic Action around the Broiler Industry that describe in depth the hazards and climate justice effects of chicken production. Carson developed her own sense of justice, Musil told his audience, from her family’s Presbyterian background. She also worked closely, when in graduate school at Johns Hopkins, with Raymond and Maud DeWitt Pearl, noted biologists, who were among the first scholars to denounce the prevailing, racist eugenics theory and join the NAACP. Later, Carson’s friend and literary agent, Marie Rodell, brought Martin Luther King’s first book, Stride Toward Freedom, to publication in 1957, as Carson was about to begin her work on Silent Spring. Musil also stressed in his lecture and in discussion with Guilford students and faculty, that Carson, and hence, the RCC, not only oppose CAFOs, and their adverse effects on water, air, climate, workers, and nearby citizens, but also look to broader policy and political changes. Such civic and political engagement is essential, Musil said, if real change is to take place in North Carolina and across the nation. In fact, Musil had just come from meetings with North Carolina Governor, Roy Cooper, his staff, and members of the NC legislature to advocate for reforms in animal production and against the Atlantic Coast Pipeline (ACP) proposed to carry fracked natural gas to eastern North Carolina. At the conclusion of RCC President Musil’s visit, Guilford College became the 44th college campus to join the Rachel Carson Campus Network (RCCN) with nearly fifty new activists signing up to carry on the legacies of Levi Coffin and Rachel Carson.